Google Lens was first teased at Google’s I/O conference in 2017 and later debuted exclusively on the Pixel 2 smartphones at the time of their launch. To the delight of Android users, at MWC 2018 Google announced that it will unveil the Lens app to other smartphones via Google Photos and Google Assistant. While the feature was added to Photos app last week itself, we now have the first bunch of smartphones which have received the update to enable camera-based Google Lens. Google Lens is now available, as per Droid Life, on Samsung Galaxy S8, S8+, Galaxy S9, and Note 8. This means that you can head over to Google Assistant and tap on the Google Lens icon in the bottom right. This will fire up a camera-like viewfinder allowing you to tap on objects which you want to know more about. 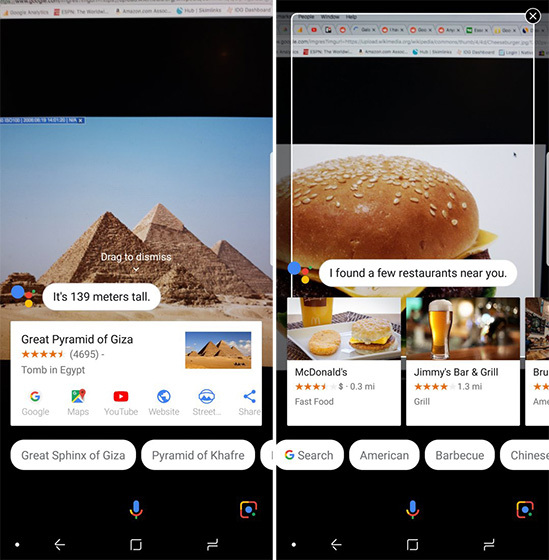 Google Lens uses machine learning to recognize objects within images and to search information. It provides relevant suggestions related to the identified objects and prompts actions like translating something or saving a search. Notably, the included devices already have a similar program called Bixby Vision which was introduced last year but hasn’t been picked up really well. The Google Lens integration in the Google Photos app is different in the way it performs. Instead of recognizing objects in real-time, the Photos version identifies objects from the already captured images which are saved in the app. So, if you have any of these devices, you can try engaging with the objects around you. It really comes in handy when you’re out exploring an uncharted part of the city, identifying plants and birds, or while visiting sites of interests such as monuments or museums. It can also be used to read barcodes and saving contacts by scanning business cards. In case you haven’t received the update yet and are eager to try the new feature out, you can enroll yourself in beta testing for the Google and Assistant apps.